• To plan, develop, activate and promote community programs. • To obtain and control finances to be used for these objectives. • To encourage all citizens to assume their share of responsibility and to their share of responsibility and to participate in the support of community programs. WE NEED YOUR HELP TO MAINTAIN THE RINKS!! First come first serve basis. NO EARLY REGISTRATIONS. Programs may limit registration. All programs subject to changes. Low enrollment or no leaders will cause cancellation. Child’s proof of age is required for some programs. Medical waivers MUST be signed by the participant or the parent/guardian of a minor participant when registering for the program. 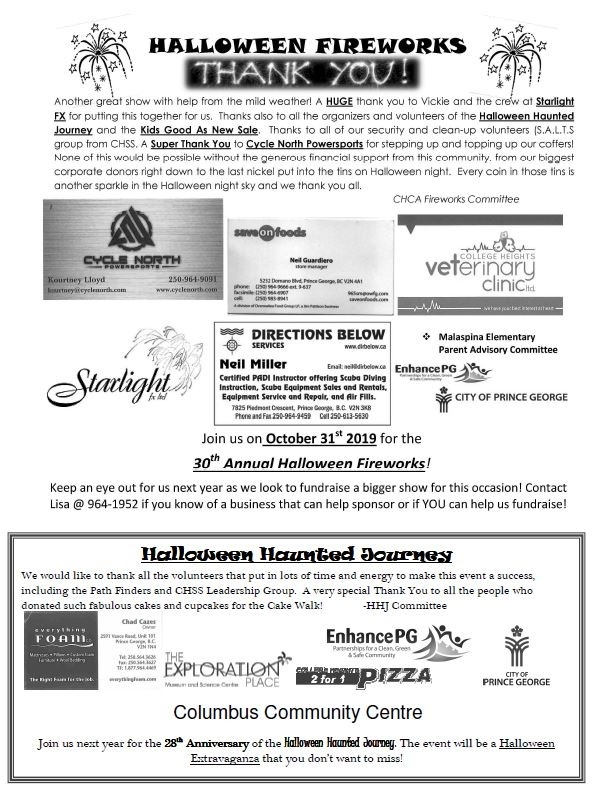 Cheques are made payable to CHCA and one for each program is required. **Please note there are two program fees. To receive the discount program rate, please attend Registration Night on Monday, March 11, 2019. After March 11th regular program fees apply. If you can not attend Registration Night, have a friend sign you up. Registration forms are available one week prior at Kool Cats Kid Care and College Heights Preschool. Click Preschool, Youth or Adult Winter Programs to the left to see what programs are available. The CHCA would like to thank the various people who make the facilities available for programs. Registered participants only in the facility. Stay in the specified program area. Leave all outdoor footwear at door. Be on time, as doors will be opened for a limited time. Parents, please make sure your child makes contact with the leader and DO NOT leave your child unsupervised before or after programs. Parents will be contacted to pick up unruly children. Please Note: Anyone Requiring Special Needs Access for Registration Night call Cheryl at (250) 964-2662 prior to March 10th. Punch Cards for Adult Programs 10 Visits $50.00 Expires May 16, 2019. Available at programs where the card is accepted! Internal Registration was held in early March. Limited Spaces available. $25.00 Non-refundable Registration Fee Required. These are 9 1/2 month programs. Classes are offered from September to June. Classes are subject to change, depending on enrollment. All instructors are Early Childhood Educators or Assistants, they have cleared Criminal Checks and have current First Aid. Registration is on-going. Please call Cheryl (250)964-2662. Child must be toilet-training and three (3) years old by December 31st, 2019. We offer a fun, safe, inclusive environment. Our Early Childhood Educators instructors and assistants offer a balance of individual, small and large group activities where we address goals such as physical, social and emotional development. Children learn to interact with others, problem solve, and are safely guided through issues such as empathy, impulse control and aggression. Our semi-structured two hour program includes teacher guided activities as well as child led activities. Registration is ongoing. Limit 16 children/class. Parents have the option of either Non-Parent Participating (No Duty Days) or Parent Participating (one Parent Duty Day per month). We have morning and afternoon classes . These programs have 2 instructors. Parent Participating (1 Duty Day per 4-6 weeks) $45.00 per month OR Non Parent Participating $50.00 per month. Parent Participating (1 Duty Day per Month) $90.00 per month OR Non Parent Participating $110.00 per month. Fees subject to change. (Children born in 2015) Limit 16 children per class. For children born in 2015, in their last year of preschool, we will be offering a 2.5 hour class 2 OR 3 times a week. These classes will be comprised of group activities, basic science activities, hands on arts & crafts, as well as pre-writing and reading activities to help prepare them for kindergarten. These Non-Parent participating classes will have two instructors. All classes are subject to change or cancellation, depending on enrollment. Fees subject to change. Teaches teamwork and basic skills. Parent participation is appreciated. Limit 24. Parents and children can enjoy games, circle time and other activities in a gym environment. Parent participation required! NOTE: NO activities for older children. 4-5 years. Ideal for older preschool or kindergarten student. Soft soled dance slippers or bare feet. Limit 12. Ball programs are recreational and non-competitive. Fees include a team T-shirt. 10 years & up. Teaches safety when home alone. Contains Basic Fire Safety, First Aid components and Computer Safety. Limit 12. Additional classes will be offered if numbers warrant it. Must be 10 years old by June 30, 2019. 11 years & up. Prepares boys and girls to become responsible babysitters. Contains Basic Fire Safety and First Aid components. Limit 12. 8-12 years. Learn to snorkel program for beginners. 90 minutes of pool time. Certified instructors. 12 years & up. This is a PADI course put on by certified instructors. 1 ½ hours of classroom time and 2 hours of pool time. 6 - 8 years. Wear soft-soled dance slippers or bare feet. Limit 12. Instructors from Lorna Carbutt School of Dance. Indoor Coed Soccer Leaders needed. 8 - 11 years. Sticks provided. Limit 18. 6 - 8 years. Clean indoor shoes. Limit 18. 7 - 10 years. Clean indoor shoes required. Limit 18. 9 - 12 years. Clean indoor shoes required. Limit 18. 7 – 11 years. Meet with other Lego enthusiasts to share ideas and use your imagination to create with Lego. Lego is supplied. 16 years & up. Continuation of Winter program. Must have some Volleyball experience (not a beginner program). Different teams each week. Limit 30. 19 years & up. Continuation of Winter program. Different teams each week. Limit 16. 30 years & up. Recreational. Plastic blade, composite or wood stick required. Limit 18. 16 years & up. Beginner to intermediate. Will focus on physical benefits of yoga. Improves muscle tone and shape, improves strength, balance and flexibility. BYO mat. Limit 25. Call Larry Parker at 250-964-1952 for information. $20.00 Non-refundable deposit due with registration for each participant in program. Cash or Cheque ONLY. Proof of Age required (Birth Certificate or Medical Care Card). C.S.A. Approved hockey gear required. Loaner team jersey. Registration for returning players was held in early March 2019. Child must be able to skate across the width of the rink. For more information, call Cheryl 250-964-2662 or bvanderlinde@shaw.ca. When you volunteer to lead a program you take that program for FREE and receive a $20 Voucher to apply toward any of the CHCA next session Programs. Volunteer leaders also receive a CHCA Volunteer T-shirt. All leaders of youth programs must complete a RCMP criminal check. was held on Saturday November 3rd, 2018 at Fortune Palace. Thank you to the The Kids Good As New Sale Committee, for donating door prizes. A big THANK YOU to the ice rink captains and their volunteers for maintaining the five ice rinks in College Heights this winter. Gift Card Promotional for Non-Profit program. Simply purchase a Save-On-Foods gift card at their customer service desk and mention you are supporting the College Heights Community Association and 4% of the gift card sale will be donated to us for our fundraising. Haunted Halloween Journey Coordinator, Jennifer accepting PG Enhancement Grant from Prince George City Councillor Albert Koehler. These monies will be used to create new games and activities for this years Halloween Haunted Journey. Keep watching for more details through the summer. Did you know if you volunteer for the College Heights Community Association, you could be eligible for a $500 scholarship at graduation? 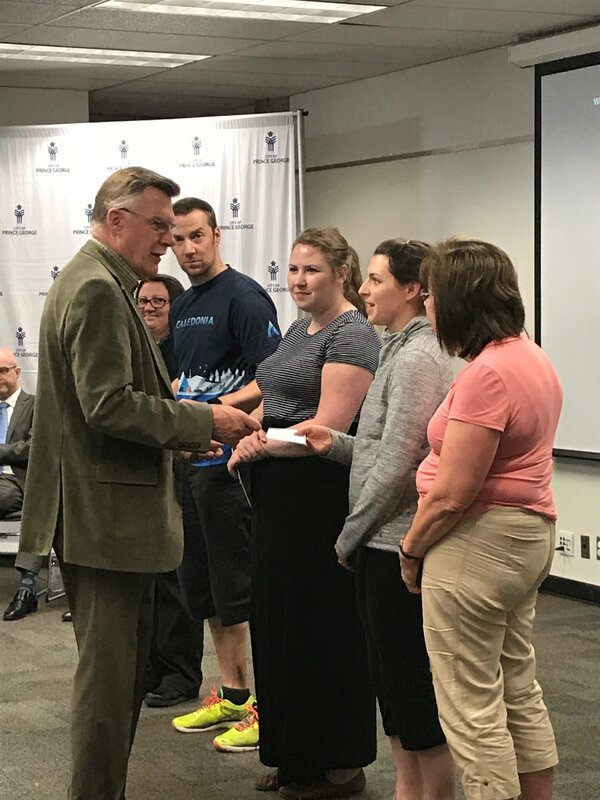 The College Heights Community Association awards a scholarship of $500 to a graduation student to further their education. You will need to volunteer a sufficient amount of hours at our various Special Events or help lead a youth program. Our Special Events look forward to having youth volunteers to help with set up, helping with the event activities and for clean up at the end of the event. If you ae able to volunteer for only a short few hours, the Coordinators are happy to offer you opportunities to volunteer for the time you are able to commit. Our programs are typically 1 hour classes and about 7-8 weeks in length. You would be volunteering with adult leaders and help teach children ages 4-12 years different sports or other skills. REGISTRATION NIGHT (FALL, WINTER AND SPRING). We always need help with setting up the tables, chairs and signs. This usually starts about 5 pm on Registration Nights and lasts about an hour. At the end of the event (8 pm) we need help to put the tables and chairs away again. HALLOWEEN HAUNTED JOURNEY - setting up the halls and assisting with the different activities during the event and clean up at the end. If you can only provide a couple of hour, your time will be appreciated. BREAKFAST WITH SANTA - Gift wrapping, setting up the hall for breakfast, face painting, elves and clean up. There are numerous jobs to assist the Coordinator. PROGRAMS - We have various programs for children 4 - 12 years old. Floor Hockey, Floor Ball, Soccer indoor and outdoor, T-ball, softball, Mini Chefs, Kids Arts and Crafts and Lego Night. You would assist the leaders for these programs for the session. Most programs run for an hour. If you are interested in volunteering for the College Heights Community Association, please contact Jean by email at jean.chcaprograms@gmail.com Your information will be forwarded to the Special Event Coordinator or Program Leader. The successful applicant must be an involved contributor to the College Heights Community Association. This award is provided so that young people will be encouraged to contribute to the community today and in the years ahead. To claim this award the recipient must submit a copy of receipt for registration from a qualifying post-secondary institution to the College Heights Community Association, Box 2662, Prince George, BC V2N 4T5 or submit it by email to treasurer@collegeheightsca.org. Community Association meetings are held the 3rd Wednesday of the month in January, October and June at Kool Cats Kid Care. The meetings start at 7:30 pm. All College Heights residents are welcome and are encouraged to come. Become involved. Here is your opportunity to become involved in College Heights Community Association. For more information on these positions or for details on how to nominate someone please contact Randy at (250) 963-7037. Nominations will be taken in advance by calling Randy or off the floor at the Annual General Meeting on October 17, 2018. You must be a member to vote. Membership applications are available Kool Cats Kid Care. Complete the application and drop it off at Kool Cats Kid Care by 6:00pm on Wednesday, October 3, 2018 to be eligible to vote at the AGM. Conveniently located beside Polaris Elementary. Kool Cats is a licensed childcare centre for school age children. Come join the Fun and Games! Field trips and other activities all summer!  Book for the days you require! $40.00 non-refundable deposit due at time of registration.